Once again, I have been out there in blogland, scouring around for some fabulously creative people. I designed this award especially for those people who, through their own creative genious, have come up with something new and unique. It may be that they've found a new way to combine Cricut cuts. Or perhaps they've developed their own texture using unexpected combinations of materials. You know who I'm talking about. These are the people we love to check in on from time to time because they are likely to have come up with an amazing idea. Also, they deserve an award for their willingness to simply share their ideas. Let's remember to give credit where credit is due. This award is MY way of doing just that. Congratulations to each of these deserving recipients and those to follow! This award is given for a particular project demonstrating an ingenious idea or method of construction. The idea must be original and not "scrap lifted" or "borrowed" or "tweeked" from another designer. As part of the acceptance, please copy the award to your blog, and also add it to your sidebar as a link back to this site. I enjoy keeping track of the recipients and giving them my own congratulations, too! 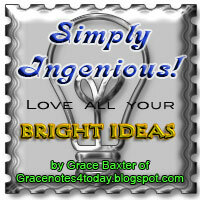 Because ORIGINAL ideas are harder to find, I ask that you carefully choose the recipients. You may select UP TO FIVE in order to keep the award special and not be burdensome for the recipients to accept (in terms of them having to pass it on to others). When listing your recipients, provide their name/s, blog title as a link, and their special project name with a direct link to that project. This is what makes the award special. The links will be found by thousands through Google searches, thus directing new visitors to their sites. Exciting stuff! 1. Connie and Susan of 2 Krafty Girls. One great project is their paper lace dress. Beautifully done! 2. Giselle of Cross My Heart Papercrafts. The cute project that caught my eye was her "Caught the Bug" tissue box. Lots of work and very well done. 3. Heather of Houses Built of Cards. Her lovely 50th Anniversary Card features pictures of the happy couple, then and now. Great idea and a lovely keepsake. 4. Jenny of Kottens Corner. Jenny created a unique "album" in the shape of a Christmas star or snowflake. Charming, and adaptable in so many ways. 5. Karen of Papercraft Memories. 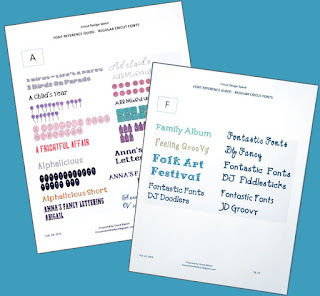 Karen designs Word Art scripture verses which she generously shares with anyone who wants to download her freebies. Here's one of her cards using WordArt. Congratulations to all these talented crafters. Now it's time to follow them and see who else they find worthy of this special award. If YOU have created something unique and special, please contact me. I'll take a look at what you've done and you may be eligible to receive this award if your work is original (as far as can be determined). Or if you KNOW of someone who is incredibly talented and creative, pass the award on to them, with the understanding that they follow these simple rules. Thank you so much Grace! It's nice to be surprised like this. I don't have much time to blog lately, but this sure is a blessing to me!